IBM, Armonk NY (1971), 17.4 x 24.6 cm, paperbound, 76 pages. was issued in 1971 upon the closing of IBM Watson Laboratory at Columbia University to commemorate the accomplishments of the lab in its quarter century at Columbia, and to document its history. The author was an IBM employee at the Yorktown Heights research center, where most of the Watson Lab staff went when they left Morningside Heights. Jean Ford Brennan had previously published another book, The Elegant Solution , Van Nostrand (1967), on computer history: Napier, Pascal, Leibnitz, Babbage, Boole, binary systems, early calculating machines; von Neuman, Stibitz, Aiken, ENIAC, UNIVAC, IBM's early computers, computers in the 1960s. I don't believe the book was sold commercially; it has no indication of printer or price, no ISBN, and no Library of Congress card catalog number. It was most likely distributed free of charge to Watson Lab members; Columbia University officials, faculty, and library; within IBM and possibly also to its customers and/or other universities. I don't know how many were printed. It is attractively designed, printed with a dark green ink on sepia paper, and surprisingly sturdy after all these years (my copy is still in one piece after cover-to-cover scanning on a flatbed scanner). It includes photos on nearly every page, rendered at a rather low resolution and contrast, no doubt for effect (since some of them go back to the 1920s). Some photos straddle the the spine and do not line up perfectly; this is evident in some of the scans such as this one. The quality of the scans is about the same as the printed pages; no attempt has been made to touch up the images. Many of the photos are available in larger sizes and/or better resolution in the Columbia Computing Timeline as links from the 1929-70 entries. The text was obtained column by column (two columns to a page) from the scanner with optical character recognition and then corrected -- sometimes massively -- by hand. If you spot any uncaught typos, please let me know. Some notes and corrections follow (numbers in parentheses refer to page numbers in the Brennan book). (vi) Foreword: Seymour Koenig's son, Andy, played in the Lab as a kid and then wound up working here as a programmer in the 1970s; now he's at Bell Labs. (23) The Improved Lunar Ephemeris (ILE) was published in 1954, not 1949 (although the calculations on the SSEC probably were done in 1949). The full title is Improved Lunar Ephemeris 1952-1959 , but nevertheless the "complete description there given, with its detailed list of all terms included, constitutes the formal specification of the present lunar ephemeris" (i.e. 1960-71) [ Explanatory Supplement to the Astronomical Ephemeris and Nautical Almanac , prepared jointly by the Nautical Almanac Offices of the United Kingdom and the United States of America: H.M. Nautical Almanac Office by Order of the Lords Commission of the Admiralty, London, Her Majesty's Stationery Office (1961), p.106]. (57) Columbia Graduate Students Who Received Their Doctoral Degrees Under Watson Laboratory Auspices. Should include: 1965, Harry F. Smith, "Numerical development of Harmonic Series for the Coordinates of the Moon" (Applied Math), Sponsor: W.J. Eckert. (57) Doctoral Students: John J. Hall, Physics. He was married to Annie Fabre (Hall), who naturally spent much time at Watson Lab too. Annie returned to the building in the 1980s as receptionist, mother hen, historian, Queen, and troublemaker and remained until 2001, just barely too late to help with the Columbia Computing History project. Btw John J. Hall (as Annie pointed out) was an unfortunate name to have at Columbia, resulting in frequent mail delivery mixups with John Jay Hall such as John and Annie once receiving a $2000 catering bill. 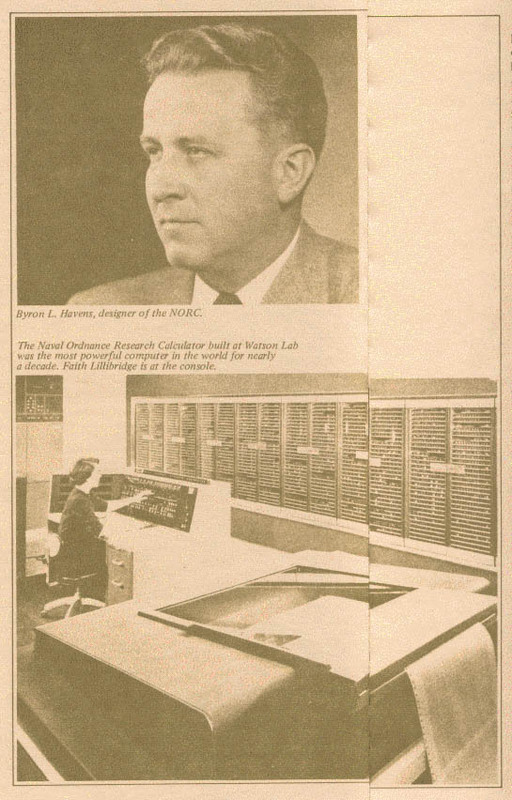 (58) Watson Fellows: As noted in Brennan, Kenneth King went on to become the first Director of Columbia's Computer Center. Joe Traub returned to Columbia in 1979 to found its Computer Science Department, and to chair it for many years. From Dr. Herbert R.J. Grosch, Watson Laboratory, 1945-51. References in brackets are to page numbers in Grosch's Computer, Bit Slices of a Life. Rererences in parentheses are to the Brennan book. (vi) Foreword: Ken Clark is the only IBMer I knew who had a copy of the IBM Symphony . (1) The Butler nickname was Nicholas Miraculous [54,59]. "Thomas J. Watson, Jr." is correct but not "Thomas J. Watson, Sr." . (4) For "the interpolation of" say "working with". Interpolation requires multiplying. (5) There was further development of the 805 at the WSCL . (8) The special equipment and modifications took some time. The engineer was a young Red Dunwell. (10) The first sentences of "The War Years" are misleading. The Naval Observatory reached out to Eckert and IBM . For "U.S. Air Force" say "Army Air Corps". Say "was able to cut down the astronomical and marine tables for aerial use, and print the data" . (12) Upstairs illustration shows Betsy Stewart, Lillian, and Beth Thornton (receptionist). See Later notes about (60). Downstairs, Marjory Severy Herrick (60). Note aged 285 in foreground . (14) Insert after "in 1946", "with Grosch, appointed Associate in Astronomy at the same time," and pluralize "member" to "members". This and later omissions reflect nervousness at the WSCL and Galactic Headquarters in 1971 that IBM had had me removed from the directorship of the NBS Center for Computer Sciences and Technology a year before, signaling that I was a Poor Type, and undoubtedly anti-IBM[Chronology]. Very strangely, omits the central role played by Los Alamos / von Neumann / Feynman / Marshak in establishing and using the WSCL to supplement bomb calculations in New Mexico [28ff]. After "Aberdeen Proving Grounds," insert "the prototype 604,". For "Eckert connected" substitute "the inventor H.P. Luhn, who later worked with George Kimball of the Chemistry Department, connected" . The only device Eckert ever touched himself at WSCL in the 1945-51 years was the astrometric engine (ill, 18). True of 1941-42 at the Naval Observatory also, but I assume he did a lot there in 1940. Von Neumann was a great figure in the theory of computers, and later in their design. The senior figure in practical computing at Los Alamos was Feynman, who advised the IBM shop . Note, however, my experience . (15) Interesting new point: in my writings I've said the 116th Street lab was forty feet wide , but scaling the picture gives 25! Also it shows "portholes" on the fifth floor. (16) Change to "the peripheral machines was to be determined by plugboards." The SSEC itself was controlled by the wide paper tapes . (17) Change to "and two computing rooms." (ills, 12). Change to "Laboratory's machines by Eckert and Grosch ... subject to" . (18) In the caption to the Lentz picture, say "beginning in 1948." Little was put together by early 1951. (19) Similarly, change "completed" to "begun". The "eight year delay" was really about three. The huge machine did not scan the plate. It improved tentative settings read from a card . Change "punch-card reading heads" to "punched card readers". They were big as well as static. (20) Change to "two annual Watson Lab fellowships to students, in later years selected" (58). Eckert picked those through Hamid with informal advice at the luncheon table at the MFCCU. Becky is listed in the 1950 catalog as a WL research associate, not connected to Columbia. And the whole team of youngsters downtown wrote the SSEC programs, assigned by Ken. Change "eight" to "sixteen". The lunar ephemeris program was not, NOT, checked out until a day or two before the dedication . (22) Again, delete "Sr." in the long caption. (25) It should be made clear that the decision to build Defense Calculators was T.J.'s. "IBM" is a euphemism. Tom Junior, Jim Birkenstock, Cuthbert Hurd advised. The Old Man decided . (26) The DC/701 was not, NOT, patterned on the IAS machines. I was there !! (32) Beyond my time, but I'm puzzled by the Brillouin itinerary. He came to the WL in 1949, had a small office next to mine, and inherited my nicer one when I left [in 1951]. I found in Pugh "Building IBM", p.229 and esp. Note 22, p.375, indication he taught in Poughkeepsie, prolly as I had done [121, 152]. Now he never would have lived in Poughkeepsie, so my guess is he was at Columbia but flittered up on the train to lecture. And, nice Brennan photo (30) shows him in the 116th Street library --- note globe, and ceramics collection hippo (persian bright blue) on "my" walnut shelves. Thomas has his back to Mary Noble's Newton. (53) References. Properly between 4 and 5 add: H.R.J. Grosch, editor, Proceedings, Scientific Computation Forum, 1948 , International Business Machines Corporation, 1950, 126pp, diagrams. Correct Eckert entry to read 1946-70, not 1947-70. (56) Appendix III not suitable. (56) Appendix IV: Robert Jastrow was H.L. Thomas's first doctoral student; he received his Columbia Ph.D. in 1948, after having received his AB and AM degrees here previously. (58) Change headings to "Watson Laboratory Fellowships". Applied Math nomenclature was later. Leon Brillouin started in 1949. Great job... thanks for doing that. I really enjoyed reading it. I'm amazed how many of the people mentioned there I've come across in Yorktown, not realizing, for some, that they had started at Watson Lab. Lentz, Garwin, Koenig, Triebwasser, Holtzberg, Price, Haskell Reich, Kreighbaum, Flehinger, others. Further to who we are: we all worked for John J. Lentz on the project that became, years later, the IBM 610. Our offices and laboratory were on the fifth floor, except the small drafting room was on the fourth floor. John died a few years back, maybe 8 or 10. He was a brilliant engineer, and our debt to him is extraordinary. Jean M. Taylor, nee Mabrey, draftswoman, p. 63, misspelled as "Mabry"